When Is Meyer Lemon Season? Are Meyer Lemon Trees Self Pollinators? How Do I Tell if My Lemon Tree Is Dead? How Many Lemons Does a Lemon Tree Produce in its Lifetime? When Do Lemon Trees Bloom? How Cold Hardy Are Lemon Trees? Meyer lemons are in season in the fall and winter. Mature fruit left on the tree keeps throughout the winter for picking, as needed. A single tree produces enough fruit for family use. Use a liquid all-purpose fertilizer every other week, while you water. Use a balanced fertilizer that includes iron, zinc and manganese. Avoid using fertilizing stakes. Meyer lemon trees are small and compact. The "one size fits all" fertilizing stakes will over-fertilize the Meyer lemon tree and damage the root system. Use an acidic fertilizer with high nitrogen content (2-1-1) during the tree's growing season. Meyer lemon trees develop new growth in late winter and June through August. During these months, stop using the all-purpose fertilizer and use the 2-1-1 fertilizer. This will encourage the development of more lemons. 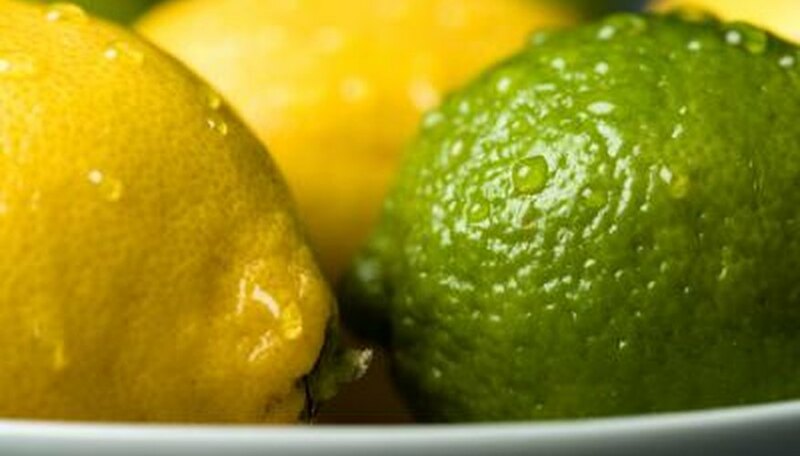 The most obvious difference between lemons and limes is their color: lemons are yellow, limes are green. Both belong to the family Rutaceae, but the genus and species differ. Lemons fall into the citrus limon genus and species; limes fall into to the citrus aurantifolia species. 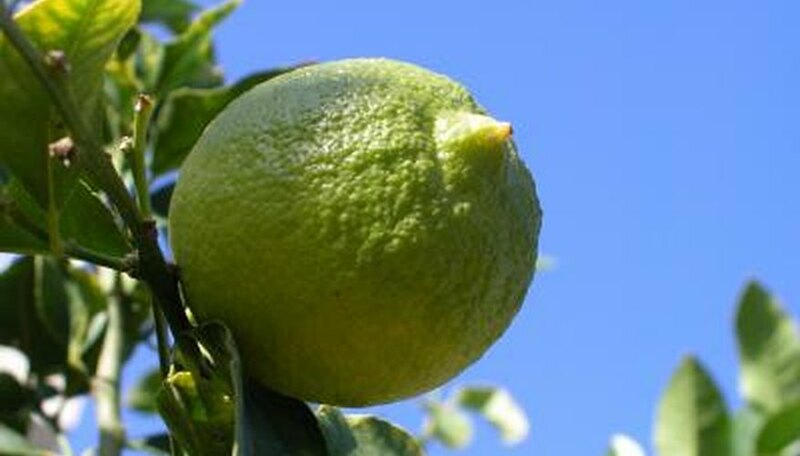 Limes originated in Southeast Asia, but the fruit has been introduced to European countries as well as Florida and California, according to Encyclopedia.com. 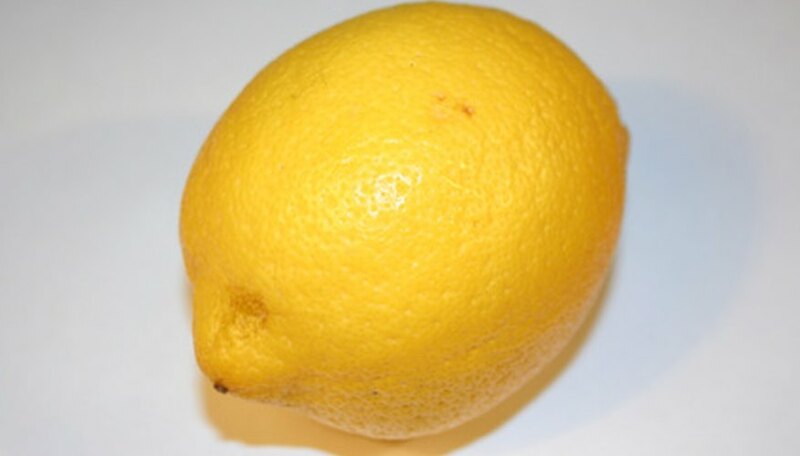 Lemons have been linked to northwestern India, southern Italy, Iraq, Egypt and China, according to Purdue University. The lemon grows on a tree that may grow to 30 feet tall; limes grow on a shrubby plant growing anywhere from 6.5 to 13 feet. 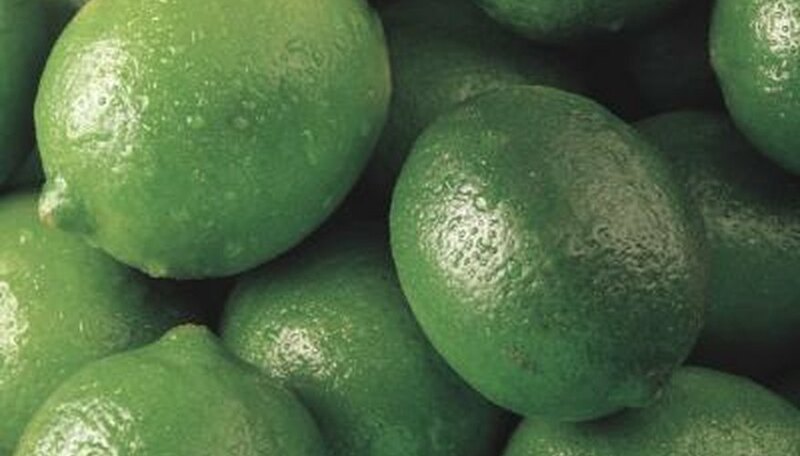 According to Purdue University, there are seven varieties of limes. Meanwhile, the university lists at least 20 known varieties of lemons. According to to Ageless, the lime has cooling and astringent properties, while the lemon is aromatic and cooling with anti-inflammatory and diuretic properties. Meyer lemons are the best lemons to grow in Southern California, as this is the type grown commercially in the state. The tree grows 10 to 20 feet tall. 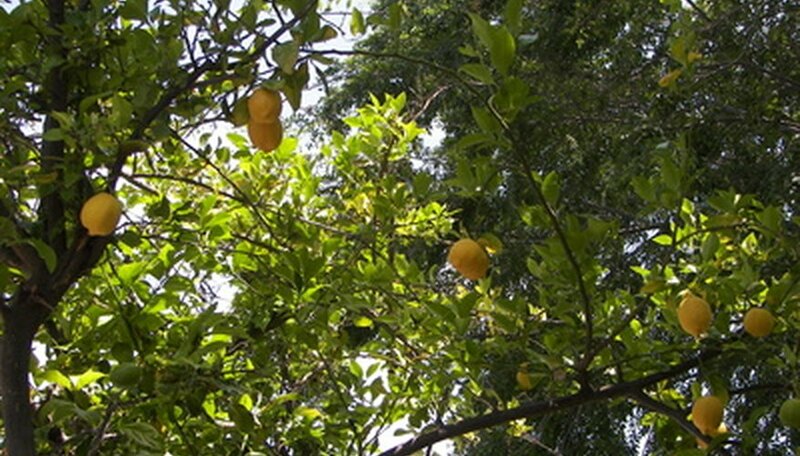 The trees will produce ample lemons two to three years after planting. The Meyer lemon (Citrus meyeri) is a low growing citrus tree, reaching a demure height of between 6 to 10 feet. Originally native to China, the Meyer lemon is commonly grown in warm and temperate regions, valued for its fruits and its flowers. The Meyer lemon produces clusters of extremely fragrant pinkish white flowers that attract butterflies. The fruit of the tree is slightly sweeter than other lemon varieties. Meyer lemons should be planted in moist soils in full sun locations. Japanese mockorange (Pittosporum tobira) is a low growing evergreen tree that reaches a maximum height of about 15 feet. Frequently grown as an ornamental, Japanese mockorange boasts attractive oval leaves and clusters of tiny white blooms. The tree gets its name from its flowers, which produce a sweet fragrance similar to an orange blossom. Japanese mockorange can be planted in full sun or shade, in moderately moist soils. Native to the Chihuahuan, Sonoran and Mojave deserts of the United States, desert willow (Chilopsis linearis) is a small growing deciduous tree that reaches an average height of about 25 feet. Though the desert willow is not technically a willow, that tree has a similar cascading appearance, complete with slender gray green leaves. In mid spring to late summer, the tree produces spectacular purple and white flowers that have an orchid like appearance. Desert willow can be found in sunny locations along desert washes and stream banks. Meyer lemons are “self-fruiting,” a type of self-pollination, and do not require the presence of other lemon varieties to produce fruit. One tree, under proper growing conditions, will bear adequate fruit. Examine the leaves on the lemon tree branches. If the leaves are wilted, brown or nonexistent, the tree may be dead. However, this could also mean the tree is in its dormant stage. Break a small branch or twig off the tree. If the branch breaks off without bending and appears to be entirely brown in the center, the tree may be dead. Scrape the surface of the bark on the trunk with your fingernail or a knife. If the flesh of the tree is brown and dry, the tree is likely dead. Lemon trees live 30 years or longer if properly treated and can bare up to 3,000 fruits on average. The amount of fruit varies according to the type of lemon tree, climate and location. During its lifetime, a lemon tree can produce up to an average of 90,000 lemons. Lemon trees need temperatures above or around 70 degrees Fahrenheit and will go into dormancy in temperatures lower than 55 degrees. Lemon trees thrive best in soil that is slightly acidic and well draining. Sandy soil is usually the best soil for the lemon tree. 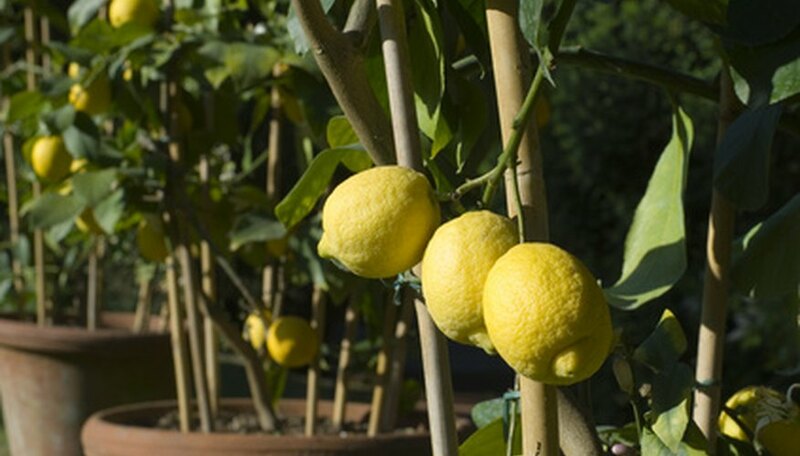 Lemon trees need to be watered every two days during the first few weeks of planting. The amount is gradually tapered off to every seven to 10 days once the tree establishes itself. The soil should be kept moist at all times. Lemon trees need full sunlight for at least six hours every day and should be placed under fluorescent grow lights if grown indoors. Apply 1 cup of ammonium sulfate to the soil for each year the tree has been growing. For example, a three-year old tree requires 3 cups of ammonium sulfate, which should be given over three to four applications throughout the year. Check the foliage. If the foliage is not a deep green color, add fertilizer. Healthy trees are more resistant to winter temperatures. Keep your lemon tree watered. If you keep the soil around the roots moist, the soil can freeze without affecting the roots. When dry soil freezes, it leaches water from the roots and damages them. Use an anti-transpirant once each month before winter. Anti-transpirants like Cloud Cover, Anti-Stress and Wilt-Pruf give the tree’s foliage four degrees of protection against the winds and cold temperatures. Drape a frost blanket over the lemon tree and anchor it with pins during cold snaps. Hang Christmas lights on your lemon tree during winter. You can also use landscape lights at the base of the tree. The lights will give off heat to help protect from freezing temperatures. Leave the lights on all night when temperatures are lowest. Protect lemon trees from bug infestation, since the damage can be very harmful and irreversible. If you notice any scabs or sores, treat your tree for citrus canker (a common bacterial infection). Prevent this disease with a copper fungicide spray in early summer, since the disease symptoms occur during late summer to fall. 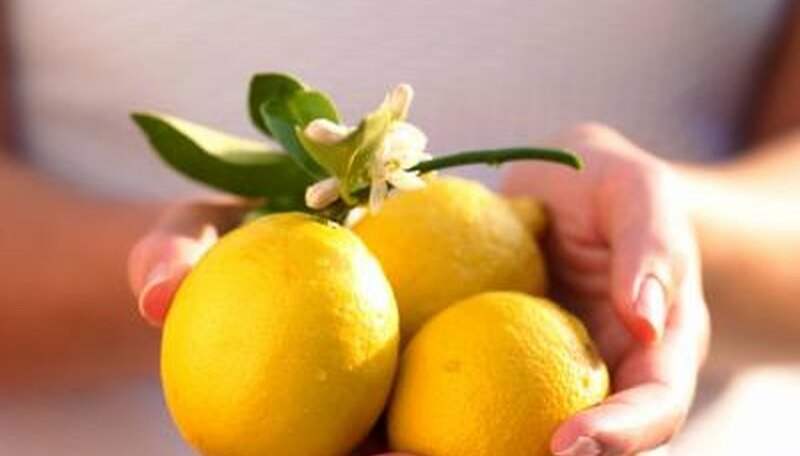 Fertilize lemon trees every spring and fall. This variety needs not only the basic elements of nitrogen, phosphorus and potassium but also zinc and magnesium. Add an iron supplement if your tree has yellowing leaves. Protect lemon trees in cooler climates; this is the citrus variety that is least tolerant of cold, according to Texas A&M University Extension. When exposed to cold air, lemon trees will drop fruit, have stunted growth and become more susceptible to disease and insect infestation. Take action before anticipated cold weather. First, protect younger trees by mounding up the soil about 2 feet deep around the trunk, a process known as banking. Drape a blanket over the top of more mature or full-grown trees so that it reaches to the ground on all sides to provide insulation and protection from cold wind. Citrus whiteflies are tiny white insects that damage lemon trees by sucking sap from the leaves. This causes the affected leaves to yellow and curl. Citrus trees are also vulnerable to California red scale (Aonidiella aurantii) and purple scale (Lepidosaphes becki). These pests are most prevalent in humid, mild climates. Citrus tristeza virus (CTV) is a destructive lemon tree disease that stunts the size of the fruit. This disease also causes cupped, yellowed leaves and pitted stems. Lemon trees are prone to several leaf diseases, including leaf spot (Mycosphaerella horii) and algal leaf spot (Cephaleuros virescens). Potential root diseases include charcoal root rot (Macrophomia phaseolina) and root rot (Fusarium oxysporum). 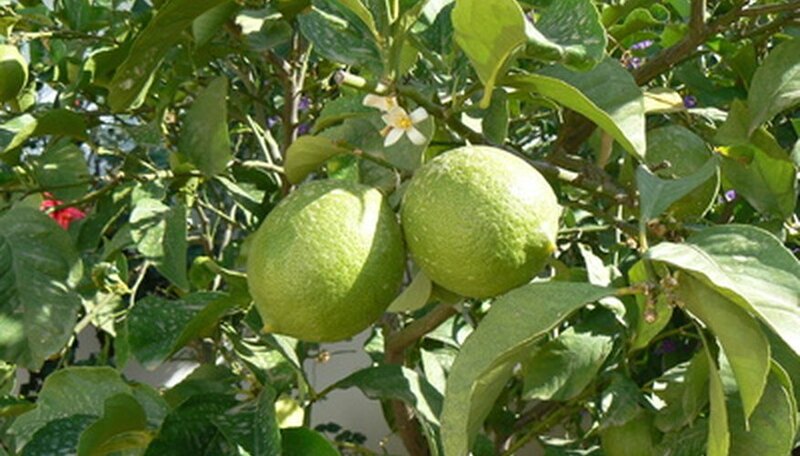 A majority of lemon tree problems can be treated effectively with fungicides or insecticides. Trim off diseased or infected foliage and dispose of away from other plants. Prune new growth on the tips of the branches to keep the lemon tree rounded and compact, and as needed to keep the tree from growing too tall. Light pruning in this manner won’t affect the tree’s ability to grow fruit. Cut away any long, out of control branches and any erratic growth that affects the shape of the lemon tree. Don’t be afraid to remove entire branches if necessary, because doing so will encourage the tree to grow new branches. Remove any dead, weak or spindly branches, or branches that are growing across into the middle of the tree instead of out. Prune any branches that are growing beneath the graft union, which can be identified by a light swelling, or scarred appearance on the trunk. Lemon trees are easier to grow indoors than orange trees. Lemon trees require less sunshine and heat than sweet orange trees; oranges need the sun and heat to develop sugar. Lemon trees prefer slightly acidic soil, about 5 to 5.5 pH. For indoor plants, use a peat-moss growing mix. For outdoor lemon trees, cover the topsoil with pine and fir needles to keep the soil acidic and deter weeds. Lemon trees grow from 10 to 20 feet tall. Many varieties have sharp thorns on the branches or twigs. The leaves are reddish when young and become green as they mature. The flowers have red buds and are mildly fragrant. 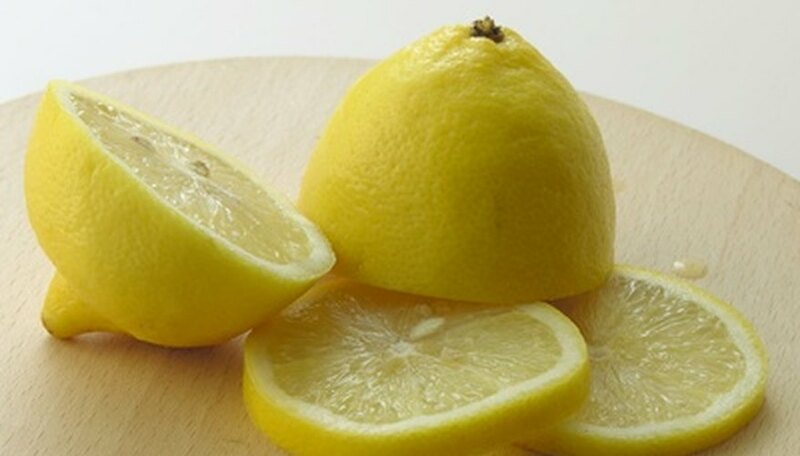 The lemon fruit usually has an oily, fragrant, yellow skin. Florida produces many of America's lemons. Lemon trees are vulnerable to disease, and in Florida, orchard farmers must be aware of and try to prevent at least a dozen different diseases. The Meyer lemon tree is a variety that does especially well indoors. It is available via online retailers for those who do not have access to good quality garden suppliers. A dwarf variety of Meyer lemon trees is best for people with smaller homes and low ceilings. Drill additional drainage holes in the container pot holding the lemon tree. Drainage is imperative to keep lemon trees free from moisture damage. Insert a water meter into the soil to prevent over-watering the lemon tree. Use a soil pH testing kit to test the container soil every several months. According to Purdue Horticulture, lemon trees need a soil with the pH range of 5.5 to 6.5. Add lime to the soil if it becomes too acidic. Place the lemon tree in a location to get plenty of sun. Lemon trees need an average of eight hours of direct daily sunlight. Move the container around or use artificial plant grow lights. Examine the lemon tree for blooms. Collect pollen on the end of an artist paintbrush. Scatter the pollen into the other flowers on the tree. Repeat using different flowers from the tree for the pollen collection. Lemon trees will self-pollinate but using the artist brush helps the tree along. Water your lemon tree early in the morning. Give your tree enough water to penetrate the roots. Use a moisture meter to check the water level at the roots. Repeat watering 2 or 3 times during the week for young trees, which need 5 gallons of water a week. Potted indoor trees also should be watered 2 to 3 times a week. Repeat watering every 7 days for adult plants. Water indoor trees daily during the hot summer months so that the soil is wet but not soggy. Monitor your lemon tree each day by checking the soil. It should be never be dry or soggy. Use the moisture meter to check the water level at the roots. Root balls should be drenched but never soggy. Remove any diseased (on seedlings this is very rare), dead or broken branches from the seedling. Use the pruning scissors very carefully, so you don't tear the tender bark of the seedling's trunk. Prune the lemon tree seedling if you are trying to shape it early on to plant in the landscape. Use the pruning scissors to carefully thin out a couple of the weaker-looking branches, as well as cutting back fast-growing branches to the node closest to where the ends of the other branches reach. Water the lemon tree seedling generously after pruning or shaping, as it will be dehydrated and need extra water. Provide a soil pH for your lemon trees that fall between 5.5 and 6.5 pH. If you are in doubt about the content and pH of your soil mail in a sample of your soil to a testing service and they will give you a thorough analysis so that you understand the baseline conditions you are dealing with. Amend the soil to be more alkaline and less acidic (bring down the pH) by tilling in the package recommended amounts of ground limestone, dolomite or hydrated lime. Amend the soil to be more acidic and less alkaline (raise the pH) by tilling in the package recommended dose of ground sulfur or iron sulfate. Water in soil amendments well at application time and keep the soil evenly moist to allow the movement of the particles down into and through the soil. Clean pruning tool blades with a solution of 1 part water to 9 parts bleach. 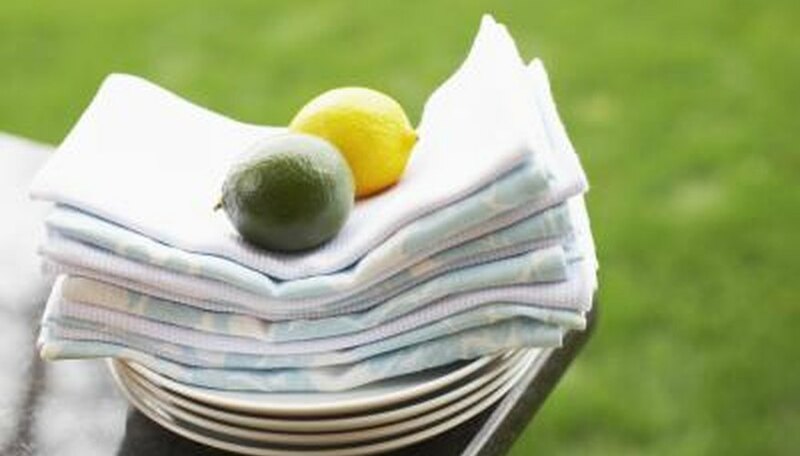 Rinse the blades and allow them to air dry or dry with a clean, lint-free cloth. Cleaning the tool blades prevents the spread of disease to your potted lemon tree. Check the lemon tree for any broken, damaged or dead limbs. Remove these limbs, making the final cut near their base leaving the ridge or collar. Make your cuts as cleanly as possible, avoiding nicks in the delicate bark around the site. Make your pruning cuts using a three-cut system. Use the pruners to make the first cut 10 inches away from its emergence site. Cut halfway through the branch on its underside. Finish the cut from above about 1 inch farther up the branch, leaving a 10-inch branch section on the tree. Remove this section last with one cut. Prune off any suckers, watersprouts and downward-growing branches. Suckers grow straight up and emerge from the base of the tree. Watersprouts are long, rapidly growing shoots that emerge in the canopy. Remove them at their base. Prune any spindly, thin or crowded branches. This helps maintain the shape of the tree while allowing light to access the inner branches. Wrap the trunk of the lemon tree from the ground level up to the lowest branches with cardboard, fiberglass insulation or corn husks. Wrap an outer cover on top of the insulating material with plastic during wet weather. Hang Christmas lights or 100-watt lamps in the lemon tree. The lights produce enough heat to minimize the frost damage to the tree. Clean the area around the tree, with as little ground cover as possible. Remove any mulch around the tree. Heat will radiate more from moist, bare soil than soil covered with mulch or other ground cover. Moisten the soil around the lemon tree. Moist soil retains more heat than dry soil. Run a sprinkler system slowly through the night or water the soil lightly around the tree to keep the soil moistened. Estimate the height of the lemon tree. If possible, measure the height with a measuring tape. The height determines how much fertilizer is needed for the tree. Apply a high-nitrogen fertilizer in a circle around the tree in early spring. The circle should be equal to the height of the tree. For example, if the tree is 10 feet tall, apply a 10-foot circle of fertilizer around it. Since all fertilizers are different, read the instructions for your product. Fertilize every five weeks until fall comes and the temperature drops. 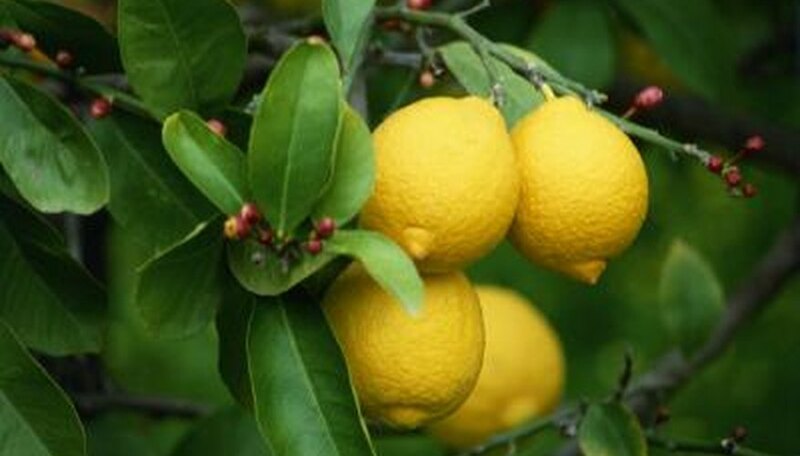 Fertilizer is not needed during the cold months as lemon trees generally do not grow during this time. Water the ground in the fertilized area to encourage fertilizer distribution throughout the soil. It takes about two weeks for a lemon seed to germinate and sprout. Plant the seed 1/4 to 1/2 inch deep, place in a warm area and keep the soil moist. It takes 15 years for a lemon tree, grown from a seed, to produce fruit. Mix together 1/2 cup of disinfectant cleaner and 2 1/2 cups of water. Place the pruning shears into a shallow tub or pan and cover them with the disinfectant cleaner/water solution. Allow them to soak in the cleaner for three minutes. Rinse them well under clear, running water and allow them to dry prior to using. Locate the graft joint on the lemon tree. This is the area where the tree was originally grafted onto the rootstock. Look for a swollen area on the lower 1 to 2 feet of the trunk. Remove any growth that is sprouting below the graft joint. Using the hand pruners, snip them off as close to the tree as possible. Use a vertical cut so the moisture will run away from the cut. Put on gardening gloves. Use pruning shears at a 45-degree angle to cut off two smaller branches from a healthy lemon tree. Cut the branches at the node closest to the trunk. Trim off all flowers and remove all leaves, except the top few at the tip of the branch. Pour a quarter-cup of liquid rooting hormone in a coffee mug. Place the cut end of the branch in the coffee mug and allow the branch to soak for one to two minutes. Place small rocks in the bottom of the potting container to provide drainage for your lemon tree roots. Fill the potting container half-full with organic potting soil. Use your thumb to make two indentations in the soil. Remove the branches from the rooting hormone and stick them into the potting soil. Cover the branches with potting soil until two nodes are completely covered. Press the soil firmly with your fingertips to secure the branches. Pour water into the potting container until the soil is moist but not saturated. Place the new lemon tree cuttings container in a sunny location. Mist soil at the base of the branches daily. Lemon trees are highly sensitive to temperature. They grow nearly year-round, do not go dormant and are unable to cope with or rebound from exposure to cold temperatures. Lemon trees will be at least partially defoliated if exposed to temperatures of 24 degrees Fahrenheit or below. Heavy frosts also cause partial defoliation. Freezing temperatures below 20 degrees kill portions of the lemon tree's woody tissue, making defoliation permanent at the damaged location. Lemon trees grown without protection from regular winds can be defoliated and scar over time. Lemon trees are sensitive to wind damage and lose leaves when exposed to a windstorm. Without sufficient amounts of manganese in the soil, chlorosis and leaf drop can result. The field tissue of the leaves between the veins turn yellow and begin to rot, and the leaves fall. Chlorosis also can be brought on by an overly alkaline soil that blocks the tree roots from absorbing the manganese already present in the soil. Most lemon trees grown indoors will bloom and fruit year-round. Depending on the variety, most outdoor lemon trees bloom in early spring and again in early summer when fruits have already set. The lemon tree is one of the least cold tolerant citrus tree varieties. Temperatures that drop below 25 degrees Fahrenheit will cause damage to the tree. Be sure to consult a USDA plant hardiness zone map before planting a lemon tree to see if it will grow in your region. Remove dry leaves from fresh lemon grass purchased from a supermarket or Asian grocery store. Make sure the stalk is green and firm, and not too dry or overly wet. Peel away all outer leaves that have become dry, then use a knife to cut a couple of inches from the top. Place the lemon grass in water and set it in a sunny location. Fill a small jar with water and put the lemongrass near a window for three to 10 days or until the roots become visible. Transfer the lemon grass into a container. Once the roots have appeared and are established, the lemongrass is ready to plant. Place it into a container that has good drainage holes and use a rich potting soil to cover the roots and stalk up to the plant’s base. Return the newly-potted plant to its location. Keep the soil moist, but do not let it become over saturated.